Run your app on a connected device or emulator. If using a connected device, be sure you have enabled USB debugging. In Android Studio, select View > Tool Windows > Logcat to open Logcat. Select the device and a process from the drop-down at the top of the window. Click Screen Capture on the left side of the window. The screenshot appears in a Screenshot Editor window. Recapture: Take a new screenshot. Rotate Left: Rotate the image 90 degrees counter-clockwise. Rotate Right: Rotate the image 90 degrees clockwise. 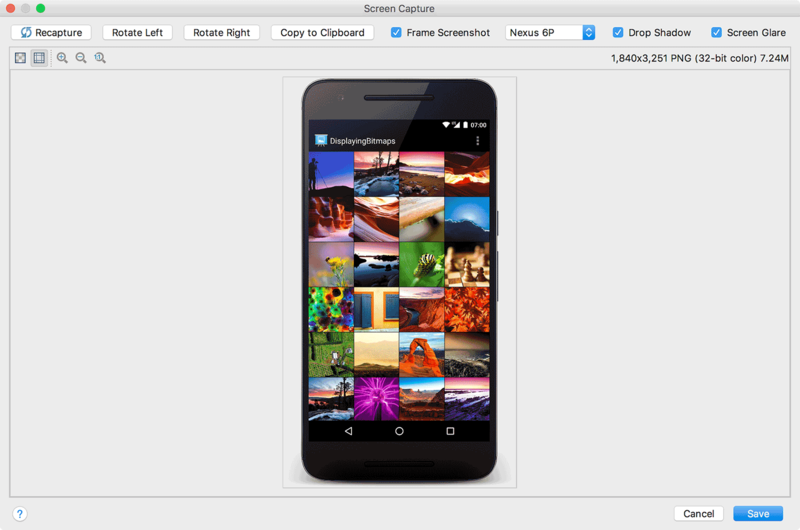 Frame Screenshot: Choose a device to wrap your screenshot with real device artwork. Select Drop Shadow, Screen Glare, or both to add these effects to your image. Note: If you select a device for the screenshot frame that differs from the actual device you captured, the editor stretches your image to match the dimensions of the device frame. You instead might want to use the online Device Art Generator, which offers device frames for other popular devices. Click Save, specify the location and filename, and then click OK.